This recipe is another from the Smitten Kitchen website, who got it from Alice Waters, who got it from Jacques Pepin. 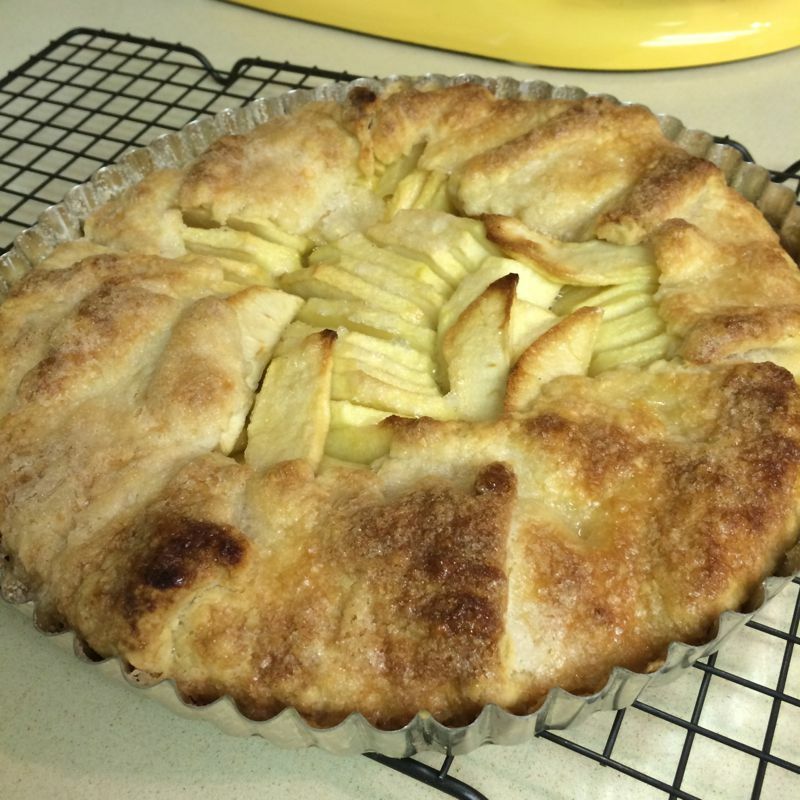 Smitten Kitchen calls it “Simplest Apple Tart,” but my husband, who lived two years in Belgium and France, calls it a “galette.” I’m going with his title. 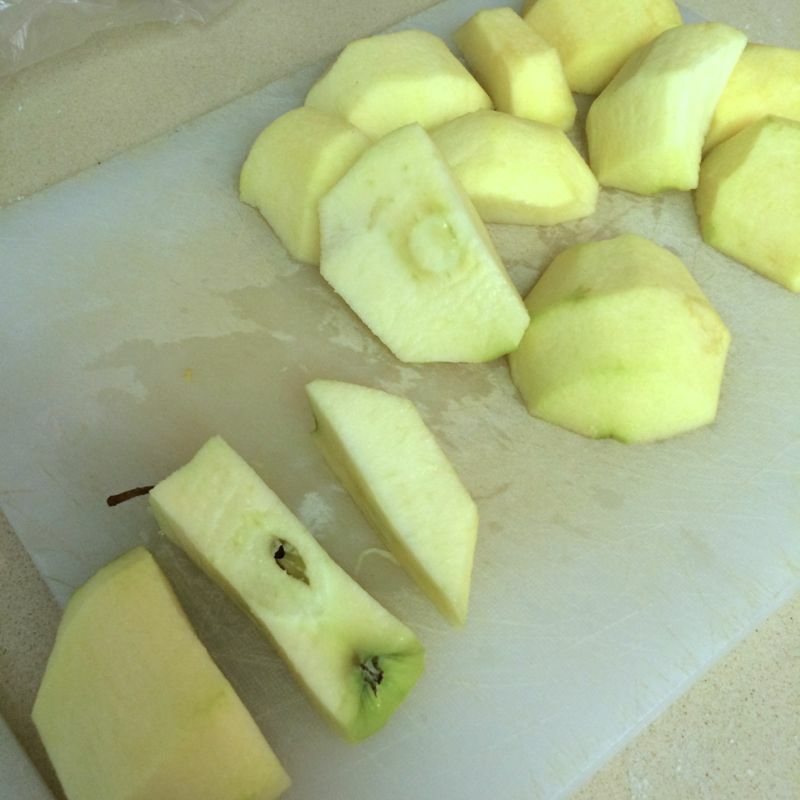 I learned to cut chunks of apple like this from my sister Christine, a stellar cook who taught me a lot of Kitchen Truths. None of this coring business–just whack if off from around the core. Now on to the recipe. To make the dough: Mix flour, sugar, and salt in a large bowl; add 2 tablespoons of the butter. Blend in a mixer until dough resembles coarse cornmeal. Add remaining butter; mix until biggest pieces look like large peas. Add a bit of water, toss, then add a little more water, until dough just holds together. Toss with hands, letting it fall through fingers, until it mostly holds together. If too dry, that is — it won’t be gathered into a ball — add another tablespoon water. Keep tossing until you can roll dough into a ball. Flatten into a 4-inch-thick disk and slip into a ziploc bag and then refrigerate. After at least 30 minutes, remove. Let soften so it’s malleable but still cold. 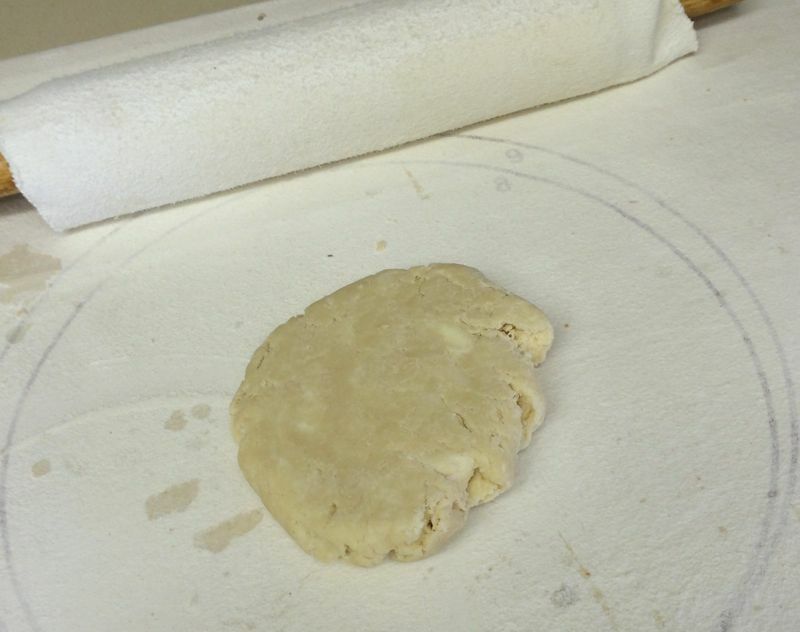 On a lightly floured surface, roll into a 14-inch circle about 1/8 inch thick. I held up my pan to make sure it was the right size. 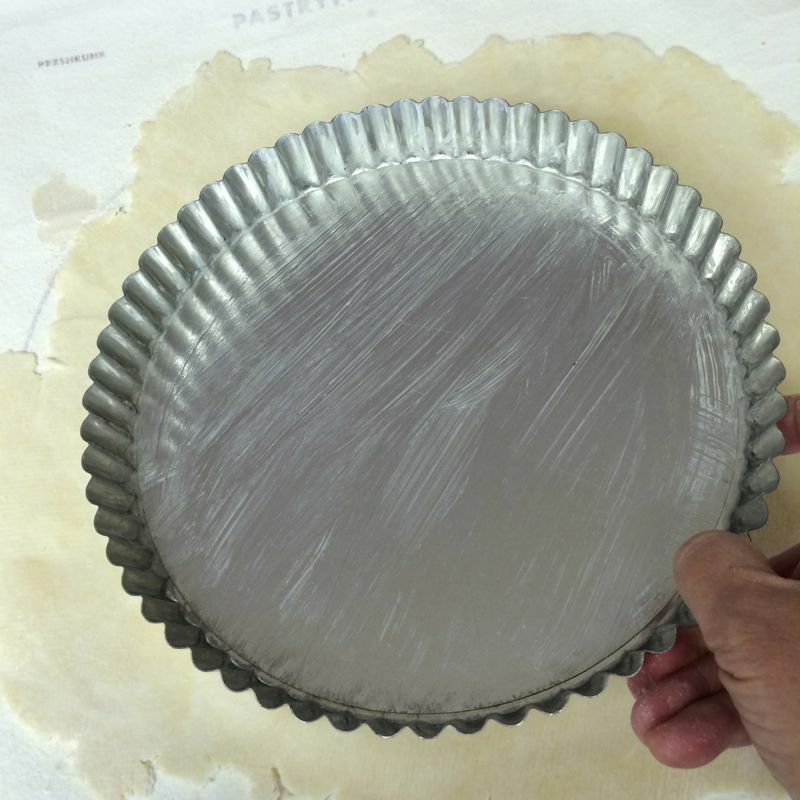 Place dough in a lightly greased 9-inch round tart pan. (You can go free-form, by simply using a parchment-lined baking sheet if you wish; that’s where my husband gets the name “galette”). Heat oven to 400°F. 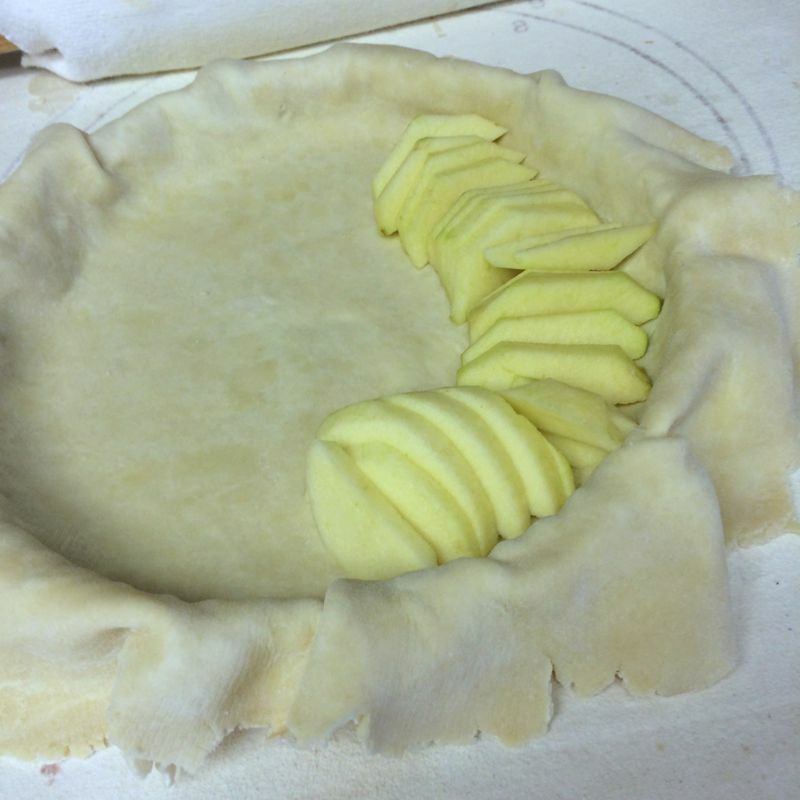 And now the filling: Overlap apples on dough in a ring up to the sides if using the tart pan (or 2 inches from edge if going free-form). Continue inward until you reach the center. I lay another layer in the center, as the first time I made it, the center collapsed. I sprinkled some granulated sugar lightly over the apples, about 1 Tablespoon. 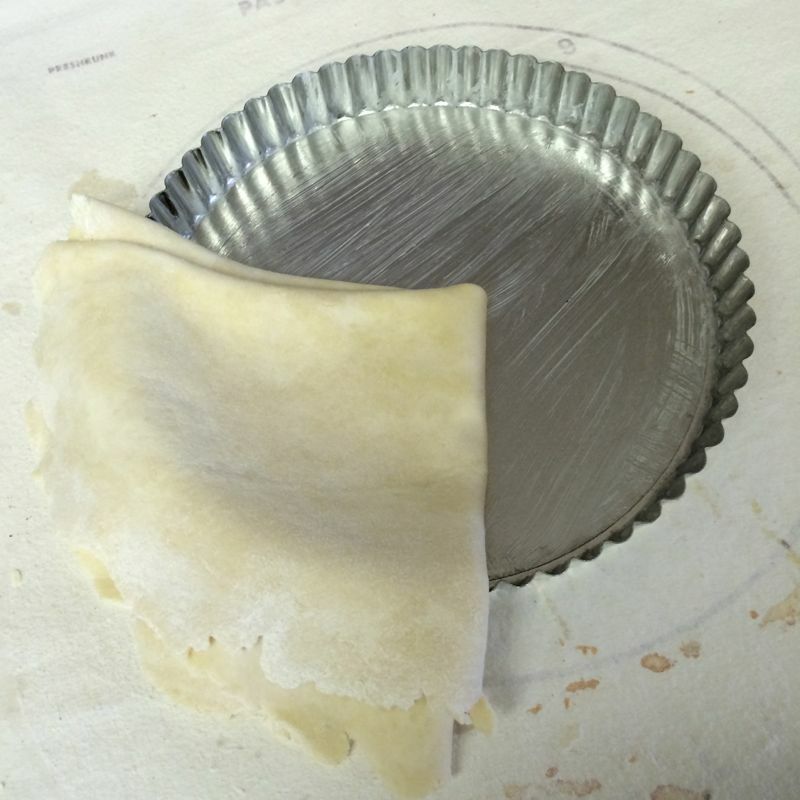 Then fold any dough hanging over pan back onto itself; crimp edges at 1-inch intervals. 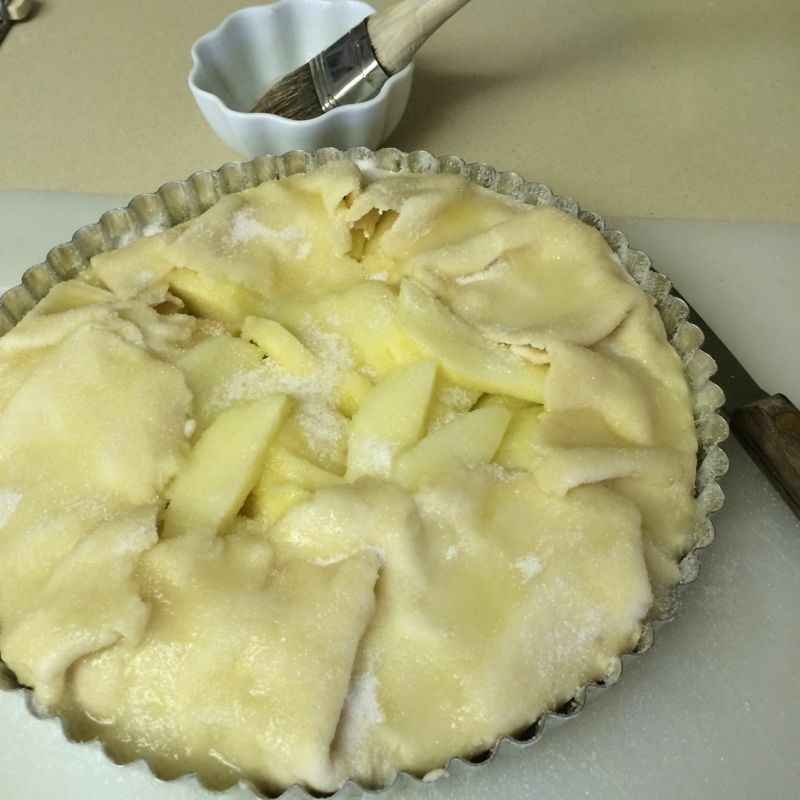 Brush melted butter over apples and onto dough edge. 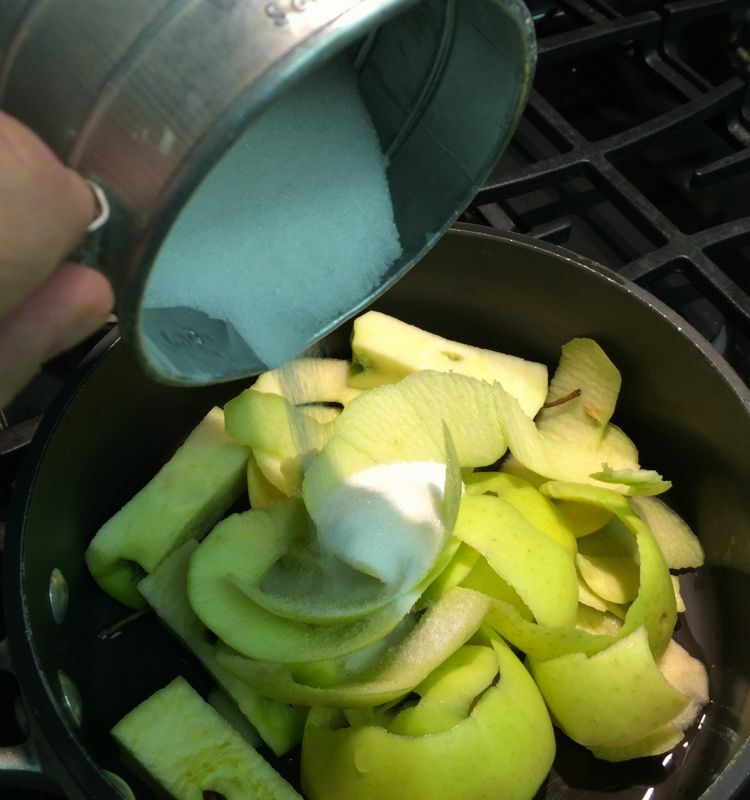 Sprinkle the remaining sugar over dough edge and apples. Smitten Kitchen notes that if you can’t get that much sugar onto the apples, that’s fine, as it makes a lightly tart/sweet dish that way. (I think by putting one Tablespoon on before folding the dough back, I was able to get all of my sugar on.) And here’s my true confession: I forgot the butter and sprinkled the sugar all over everything, THEN remembered the butter. So I just slathered on top of the sugar. My first one of these I did it correctly, but they both turned out in the end to have the same amount of deliciousness. 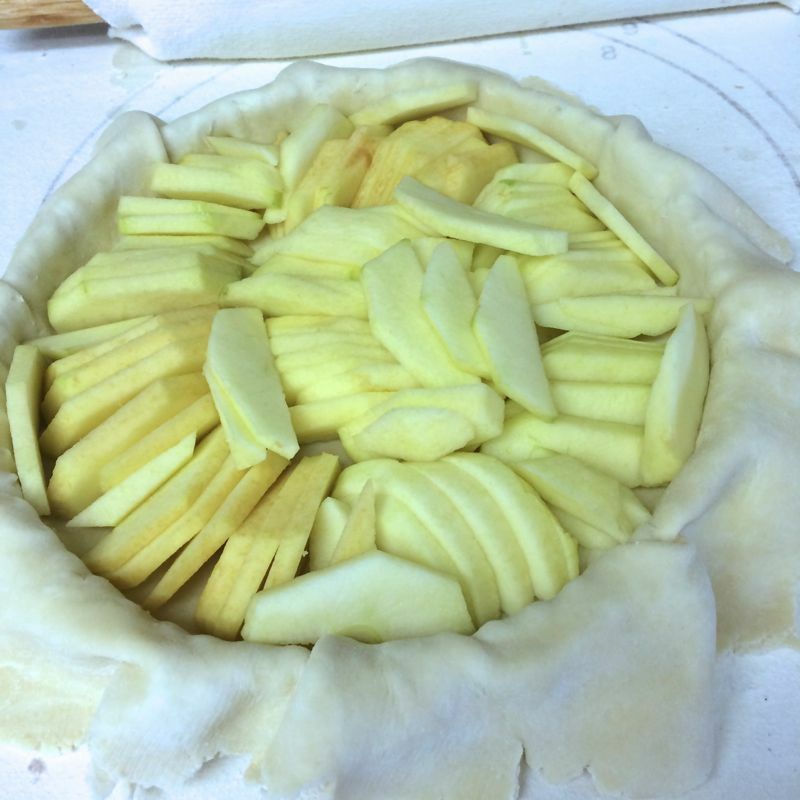 Bake in center of 400-degree oven until apples are soft, with browned edges, and crust has caramelized to a dark golden brown (about 45 minutes), making sure to rotate tart every 15 minutes. Yes, do that. 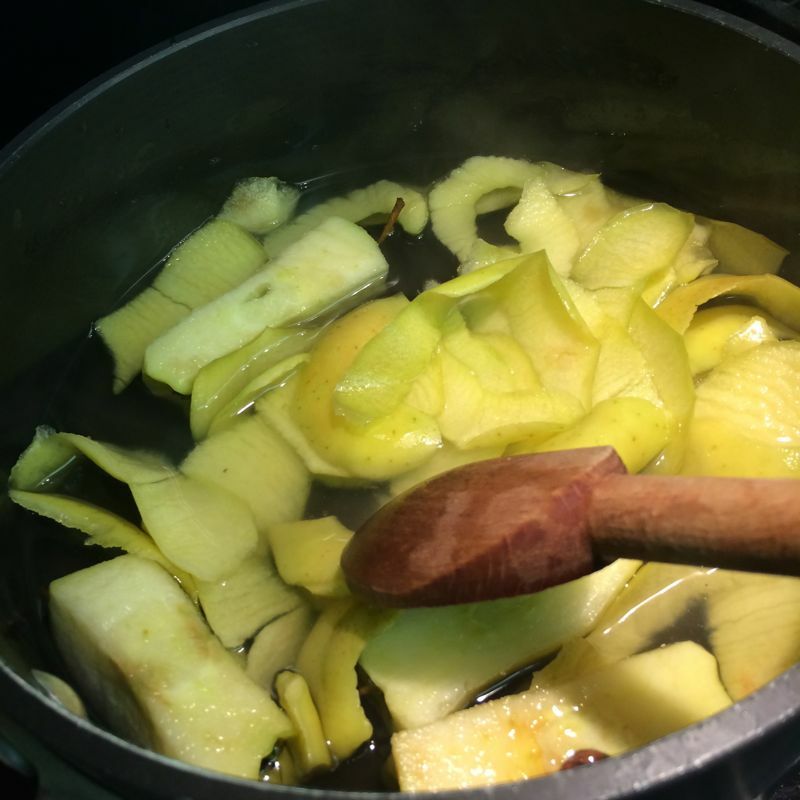 In the meantime, while the galette/tart bakes, make the glaze by putting the reserved peels and cores in a large saucepan along with sugar. Pour in just enough water to cover; simmer for 25 minutes. She notes to strain syrup through cheesecloth. But I just used a pastry brush from the pan, pushing the peels to the side to get at the syrup. And just asking. 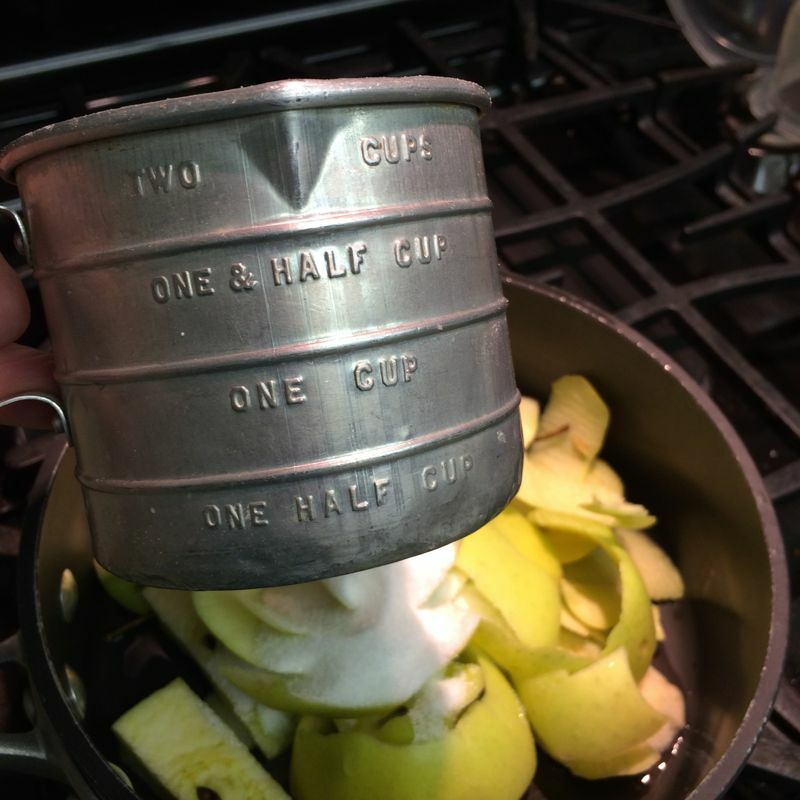 . . but why don’t they make two-cup measures like this anymore? It’s a treasure.